223 pages | 117 B/W Illus. Coarse-grained reconfigurable architecture (CGRA) has emerged as a solution for flexible, application-specific optimization of embedded systems. Helping you understand the issues involved in designing and constructing embedded systems, Design of Low-Power Coarse-Grained Reconfigurable Architectures offers new frameworks for optimizing the architecture of components in embedded systems in order to decrease area and save power. Real application benchmarks and gate-level simulations substantiate these frameworks. The first half of the book explains how to reduce power in the configuration cache. The authors present a low-power reconfiguration technique based on reusable context pipelining that merges the concept of context reuse into context pipelining. They also propose dynamic context compression capable of supporting required bits of the context words set to enable and the redundant bits set to disable. In addition, they discuss dynamic context management for reducing power consumption in the configuration cache by controlling a read/write operation of the redundant context words. Focusing on the design of a cost-effective processing element array to reduce area and power consumption, the second half of the text presents a cost-effective array fabric that uniquely rearranges processing elements and their interconnection designs. 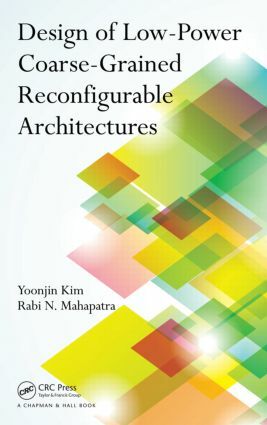 The book also describes hierarchical reconfigurable computing arrays consisting of two reconfigurable computing blocks with two types of communication structure. The two computing blocks share critical resources, offering an efficient communication interface between them and reducing the overall area. The final chapter takes an integrated approach to optimization that draws on the design schemes presented in earlier chapters. Using a case study, the authors demonstrate the synergy effect of combining multiple design schemes. Yoonjin Kim is an assistant professor in the Department of Computer Science at Sookmyung Women’s University in Seoul, South Korea. Dr. Kim was previously a senior R&D staff member at Samsung Advanced Institute of Technology in Yongin, South Korea. He earned his Ph.D. in computer engineering from Texas A&M University. His research interests include embedded systems, computer architecture, VLSI/system-on-chip design, and hardware/software co-design. Rabi N. Mahapatra is a professor in the Department of Computer Science and Engineering and director of the Embedded Systems and Codesign Laboratory at Texas A&M University in College Station. He is an associate editor of the ACM Transactions on Embedded Computing and an editorial board member of the International Journal on Information and Communication Technology. Dr. Mahapatra is also founder and chairman of the Bhubaneswar Institute of Technology (BIT) in India. His research interests include network on chip, system-on-chip reliability, low-power IP lookup architectures, and intention-based searching.